The O-bon holidays are nearly over. Back to work tomorrow. This last week was an odd week, as it always is, with the various ceremonies commemorating the end of the war coinciding with the peak holiday season. I was with an American friend in the mountain resort of Yanaizu at noon on the 15th. That's when the Emporer in 1945 gave his speech on the radio announcing the surrender, known in Japanese as gyokuon (玉音), the 'Jewel Voice'. Loudspeakers summoned the good people of Yanaizu to prayers in the square. Thankfully the Prime Minister decided not to visit Yasukuni Shrine this year. It's all very well remembering the war dead but 'A class' war criminals are interred there too and any official visit aggravates relations with China and South Korea. The TV does its best to keep memories of the war alive. One guest on a current affairs show said it's all very well remembering Hiroshima on 6th August, Nagasaki on the 9th and the end of the war on the 15th but Japan should also remember Pearl Harbor and the beginning of hostilities in China. Always interesting, and often shocking, are the reminiscences of people in their 80s and 90s, speaking up at last. As we approach the 70th anniversary, Abe is trying to rewrite the peace constitution so that Japanese forces can defend an ally under attack. It's an interesting time. Young people from Fukushima were invited to participate in the ceremonies at Nagasaki. I suppose there is a link but I'm afraid that that word 'hibakusha' sends a chill down my spine. Not only did the victims suffer terribly from the atomic bombs but they've also been victims of discrimination and I don't want us lumbered in the same boat. But this last week was also holiday time when most companies, certainly up here, take works holidays. I spent it with good friends in the Aizu area. We went up the Tadami River deep into the beautiful area of Oku-Aizu. We saw fields of sunflowers, temples, lakes and mountains. The area's branded itself 'fairy land' and you can see why: it certainly seems a mystical place. Families having fun at Lake Numazawa - paradise! The magnificent Tadami River. It has many power stations along its length. The Tadami River was developed in the early 1950's for hydro-electric power by Shirasu Jiro (educated at Cambridge, interesting man). I came across a book recently when I was tidying up the office called Fukushima: Electricity County published in the 1970s. Local dignitaries showed great pride in Fukushima's contribution to Japan's economic growth and were hailing nuclear power as the next phase with photos of Fukushima Daiichi under construction. So you see, it's not just nuclear, Fukushima has provided power for Tokyo for many, many years. 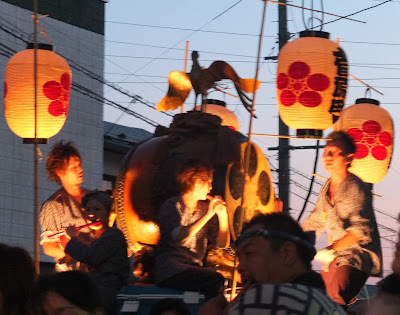 And finally, Matsuri in Kitakata. The last day of four days of festivities. Can you hear the drums?